The Royal Malta Yacht Club recently hosted the RLR Weekend Regatta which saw demanding and competitive sailing from crews encountering winds of over twenty knots. Serious partying closed off each day with a number of events held on the Club's terrace. Competitions saw a mix of round the cans for the J70 class, coastal races for the Cruising Classes and ranking races for the younger dinghy sailors. On day one, two races were held for both the cruising and racing classes, the first being a coastal race up to the St. Paul's Bay Tuna pens to finish off Tigne Point, followed by a shorter course to the Ghallis cardinal mark with a finish off Dragonara Point. The breeze from the WNW was fresh to moderate at times peaking at just under 20 knots. Showing determination from the very start, Fast Forward, skippered by Mark Vassallo, took the lead followed closely by the rest of the fleet. On day two, a shortage of crews available for both Fast Forward and Aziza resulted in the two teams joining forces. In spite of a forecast for lighter conditions, tougher winds and a bigger sea prevailed. Adding to this a number of wind shifts, made the upwind leg an interesting challenge. Once the boats rounded the tuna pens, it turned into a blissful sail downwind under spinnaker right to the finish. In the J70's class four out of the five J70 teams went out on the water for the final showdown prior to the Mapfre Middlesea J70 Med Cup. Winds of up to twenty odd knots meant a lot of fast, fun sailing downwind and even some broaches as boats got caught out by some big gusts. After day one of racing Team Bet Safe and Team Middlesea were on equal points followed closely by Team GABA and Team Comanche. On day two Team Bet Safe managed to clinch the podium position after two very close races. Team Middlesea, skippered by Timmy Camilleri, claimed second place and GABA, skippered by Lee Satariano came in third. A sizeable delegation of sailors hailing from Birzebbugia and Malta Young Sailors Clubs took part in the Dinghy Class which saw thirty boats take part in a total of six races, four on Saturday and two on Sunday. 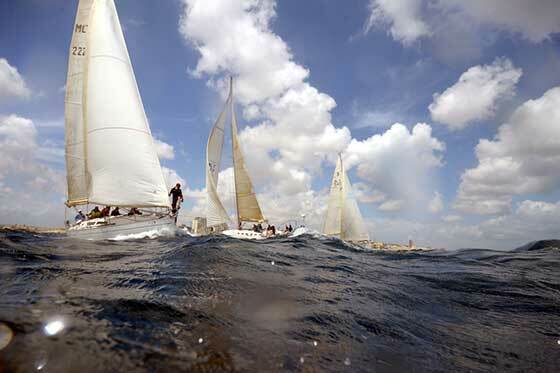 Races took place outside Marsamxett harbour and were one of a series of eight ranking events hosted by the Royal Malta Yacht Club and the Malta Sailing Federation. Classes were split into Novice for sailors who have sailed for less than a year, Cadets for sailors born between 2004 and 2007 and Seniors for those born between 2000 - 2007. The RLR Weekend Regatta social programme kicked off immediately after the Race Briefing when crews and friends hit the RMYC Terrace for a Wine Tasting event. Hosted by Cantele Wines Malta guests enjoyed a varied selection of fine wines accompanied by an assortment of cured meats and artisanal cheeses provided by Caseficio La Maltesa. Entertainment was provided by the popular Jazz Trio led by saxophonist Graham accompanied by Stephen and Michelle. On Saturday, after a full day of demanding racing crews were welcomed with beers on the pontoons followed by a mouth-watering barbecue on the Club's Terrace. Live entertainment by Ozzy Lino completed the evening as crews exchanged notes of the day. Sunday afternoon saw the Club at its busiest when all crews descended on the Club to attend the Prize Giving Ceremony which was carried out in the presence of Giselle Ripard, RLR Yachting representative who presented Class winners with exclusive prizes from the wide variety of products that RLR Yachting stock. The Royal Malta Yacht Club expresses its gratitude towards RLR Yachting for the ongoing support that they show the Club and to the volunteers who give up their time to ensure that such events take place.